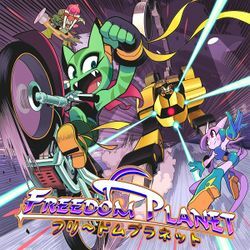 Freedom Planet began development as a Sonic the Hedgehog fangame, but DiDuro lost interest in creating a derivative work and reconceived the project as his own intellectual property. He visited the website DeviantArt to recruit artist Ziyo Ling, who replaced the existing cast of characters with her own. Lilac, originally a hedgehog, became a dragon; antagonist Doctor Eggman was replaced by Brevon; and the Sonic series' ring-based health system was abandoned. Further changes were suggested by fans and incorporated throughout development. Though Freedom Planet was developed in Denmark, its art direction has East Asian influences: its background visuals were inspired by medieval Chinese art, and the game's title is written in katakana. The game was released for Microsoft Windows, first as a demo in August 2012, then—after a successful Kickstarter campaign and a few delays—as a full game via Steam on July 21, 2014. A version for the Wii U console was announced in March 2015, but was postponed that August due to a troublesome glitch; however, the game was finally released successfully on October 1, 2015. Freedom Planet has been widely compared to the Sega Genesis Sonic games. Critics praised its gameplay, aesthetics, and balance of Sonic elements with original content, but were more mixed on its pacing and length. This page was last edited on 5 October 2018, at 23:23.